Qaddafi likely bound for "secret burial"
The bloody, half-naked body of Muammar Qaddafi was deposited in Misrata Thursday, where the ex-dictator has become an attraction of sorts, with people lined up to take his picture. It is fitting that he was brought to Misrata, as the city has become the symbol of the ex-rebel movement, having suffered a long, brutal siege at the hands of Qaddafi's forces, and later turning into the seat of the rebel council. Libyan officials said Qaddafi will be given a "secret burial," according to Reuters. The use of a secret burial recalls America's killing of Osama bin Laden, who was given a burial at sea to avoid leaving a shrine on land for his followers to gather at. It is unclear when or where Qaddafi's secret burial will be, and it is also uncertain how long his body will be displayed to the public. Once Libya's dictator for 42 years, Qaddafi was ousted in an uprising-turned-civil war. He was killed Thursday as revolutionary fighters overwhelmed his hometown of Sirte and captured the last major bastion of resistance two months after his regime fell. The 69-year-old Qaddafi is the first leader to be killed in the Arab Spring wave of popular uprisings that swept the Middle East, demanding the end of autocratic rulers and the establishment of greater democracy. "We have been waiting for this moment for a long time. Muammar Qaddafi has been killed," Prime Minister Mahmoud Jibril told a news conference in the capital of Tripoli. There were conflicting accounts about Qaddafi's final hours, with some in the interim government saying he was captured unharmed and later mortally wounded in the crossfire from both sides. A second account described how he was already wounded in the chest when he was seized and later sustained the other wounds. CBS News correspondent David Martin reports that there are even rumors one of his own bodyguards killed him, hoping to spare his "master" the indignity of being captured. Interim government officials said one of Qaddafi's sons, his former national security adviser Muatassim, also was killed in Sirte, and another, one-time heir apparent Seif al-Islam, was wounded and captured. Qaddafi's death decisively ends a regime that had turned Libya into an international pariah and ran the oil-rich nation by the whim and brutality of its notoriously eccentric leader. Libya stands on the cusp of a new era, but its turmoil may not be over. The former rebels who now rule are disorganized and face rebuilding a country virtually without institutions by Qaddafi's design. They have already shown signs of infighting, with divisions between geographical areas and Islamist and more secular ideologies. President Barack Obama told the Libyan people: "You have won your revolution." Although the U.S. briefly led the NATO bombing campaign in Libya that sealed Qaddafi's fate, Washington later took a secondary role to its allies. Britain and France said they hoped that his death would lead to a more democratic Libya. Arab broadcasters showed graphic images of the balding, goateed Qaddafi -- wounded, with a bloodied face and shirt -- but alive. Later video showed fighters rolling Qaddafi's lifeless body over on the pavement, stripped to the waist and a pool of blood under his head. Standing, he was shoved along a Sirte road by fighters who chanted "God is great." Qaddafi appears to struggle against them, stumbling and shouting as the fighters push him onto the hood of a pickup truck. "We want him alive. 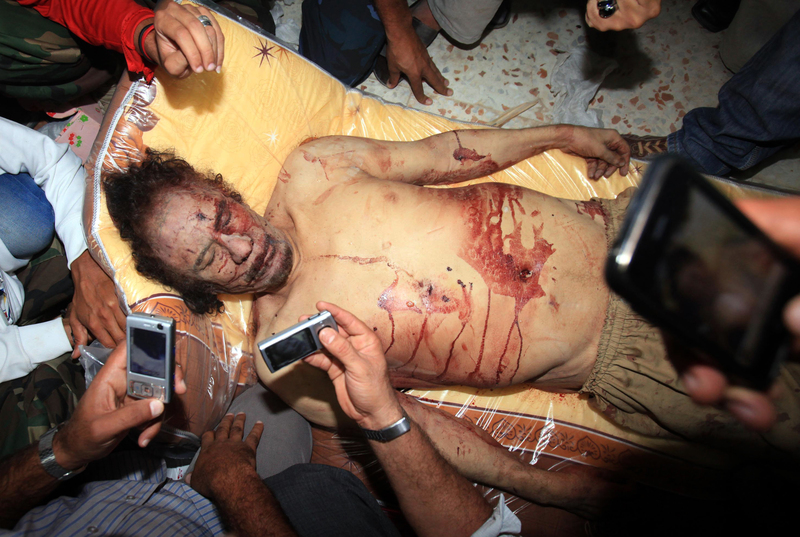 We want him alive," one man shouted before Qaddafi is dragged away, some fighters pulling his hair, toward an ambulance. Most accounts agreed Qaddafi had been holed up with heavily armed supporters in the last few buildings held by regime loyalists in the Mediterranean coastal town, where revolutionary fighters have been trying prevail for more than a month. At one point, a convoy of about 100 cars tried to flee and was hit by NATO airstrikes, carried out by French warplanes. France's Defense Minister Gerard Longuet said the 80-vehicle convoy was carrying Qaddafi and was trying to escape the city. The strikes stopped the convoy but did not destroy it, and then revolutionary fighters moved in on Qaddafi. "We found him there," Busamir said of Qaddafi. "We saw them beating him (Qaddafi) and someone shot him with a 9mm pistol ... then they took him away." Military spokesman Col. Ahmed Bani in Tripoli told Al-Jazeera TV that a wounded Qaddafi "tried to resist (revolutionary forces) so they took him down." Fathi Bashaga, spokesman for the Misrata military council, whose forces were involved in the battle, said fighters encircled the convoy and exchanged fire. In one vehicle, they found Qaddafi, wounded in the neck, and took him to an ambulance. "What do you want?" Qaddafi asked the approaching revolutionaries, Bashaga said, citing witnesses. Qaddafi bled to death from his wounds a half-hour later, he said. Fighters said he died in the ambulance en route to Misrata, 120 miles from Sirte. Abdel-Jalil Abdel-Aziz, a doctor who accompanied the body in the ambulance and examined it, said Qaddafi died from two bullet wounds -- to the head and chest. The account given by Jibril after a coroner's investigation said Qaddafi was seized unharmed from a drainage pipe but was then shot in the hand and put in a pickup truck. In ensuing crossfire, Qaddafi was shot in the head, the government account said. According to an account from Hassan Doua, a commander whose fighters found Qaddafi, the former leader already was wounded in the chest when he was seized near a large drainage pipe, and then was put in the ambulance. Amnesty International urged the revolutionary fighters to report the full facts of how Qaddafi died, saying all members of the former regime should be treated humanely. The London-based rights group said it was essential to conduct "a full, independent and impartial inquiry to establish the circumstances of Col. Qaddafi's death." After his death, Qaddafi's body was paraded through the streets of Misrata on top of a vehicle surrounded by a large crowd chanting, "The blood of the martyrs will not go in vain," according to footage aired on Al-Arabiya television. The fighters who killed Qaddafi are believed to have come from Misrata, a city that suffered a brutal weeks-long siege by Qaddafi's forces during the eight-month civil war. Celebratory gunfire and cries of "God is great" rang out across Tripoli. Motorists honked and people hugged each other. In Sirte, the ecstatic former rebels celebrated the city's fall after weeks of fighting by firing endless rounds into the sky, pumping their guns, knives and even a meat cleaver in the air and singing the national anthem. "We would have wanted him alive for trial. But personally, I think it is better he died," Bashaga said. The capture of Sirte, the death of Qaddafi, and the death and capture of his two most powerful sons, gives the transitional leaders confidence to declare the entire country "liberated." It rules out a scenario some had feared -- that Qaddafi might flee deep into Libya's southern deserts and lead a resistance campaign. Information Minister Mahmoud Shammam told AP that Muatassim Qaddafi was killed in Sirte. Abdel-Aziz, the doctor who accompanied Qaddafi's body in the ambulance, said Muatassim was shot in the chest. The justice minister said Qaddafi's son and one-time heir apparent, Seif al-Islam, had been wounded in the leg and was being held in a hospital in the city of Zlitan, northwest of Sirte. Shammam said Seif was captured in Sirte.